Whether you like a latte, energize with an espresso or kick start with a cappuccino, you want a coffee maker that can deliver. That's why Consumer Reports testers assess brew time, convenience, and even owner satisfaction on dozens of single-serve, and drip coffeemakers. TUCSON, Ariz. - An eye opener in the morning or a pick me up in the afternoon, most of us love our coffee. The experts at Consumer Reports run coffee makers through brewing performance, timing and convenience tests and say the good news is with a great coffeemaker you can get the caffeine you crave at home and for less money per cup. For coffee connoisseurs, you'll want to consider a drip coffee maker over single serve or pod machines. And that's where the brew performance test comes in. 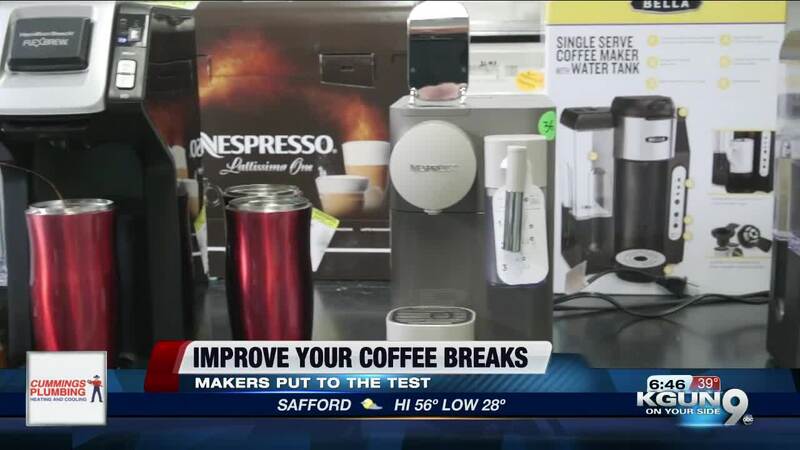 "To get the most out of your coffee beans, you want a drip coffee maker that can heat the water between 195 and 205 degrees and hold it there for five minutes or more," says Sara Morrow-Harcourt, Consumer Reports. "If a coffee maker can't do that, chances are good you're not going to get the best tasting cup of coffee." The $100 Cuisinart consistently tops CR's ratings, and for good reason! "In our most recent survey, Cuisinart earned CR's top rating for owner satisfaction," says Morrow-Harcourt. For less money you can get comparable brew performance from a $25 Hamilton Beach coffeemaker. If getting that coffee fix fast is your first order of business then a single serve or pod coffee maker might be a better option. CR evaluates single serve coffee makers for temperature and size consistency on individual cups of coffee and most important: How long it takes to deliver that first cup, then how long for that a second cup. And while there's no brew performance test for pod coffee makers, CR's expert taste testers weigh in on taste. "Of the nearly 40 single serve coffee makers CR tested NONE earns better than a GOOD rating for taste which is only mediocre," says Morrow-Harcourt. Instead, CR says to consider which brand of coffee pods you want to drink. Looking for ALL the bells and whistles? It might cost you. There is a $380 Delonghi that makes espressos and has a built-in milk frother. "It's great for a crowd of coffee lovers because it delivers not only the first cup especially fast but subsequent cups were speedy, too," says Morrow-Harcourt. Think espresso delivers the most caffeine? CR says it depends. An ounce, or one shot of espresso contains 63 milligrams of caffeine. Regular coffee has 12 milligrams of caffeine per ounce. So yes, espresso does have more caffeine. Except most of us drink at least eight ounces of regular coffee in a serving, and that would add up to 96 milligrams of caffeine.